Turner Network Television (TNT) is a cable and satellite network owned and operated by Turner Broadcasting, a Time Warner (NYSE: TWX) subsidiary. Founded by Turner Broadcasting in 1988, TNT serves as one of the company’s flagship networks, alongside TBS and TCM. The network reaches 98 million households in the United States, or nearly 86% of cable subscribers, and is currently one of the most popular networks on cable and satellite television according to Nielsen scores. TNT earns the bulk of its revenue through subscriber fees and advertisements. Turner contracts with cable and satellite providers who receive and distribute TNT programming to subscribers. Time Warner has focused much of its television revenue growth strategy on increasing subscriber fees. TNT currently collects one of the highest subscriber fees on cable and satellite television at $1.24 and one of the only fees above $1. Advertising revenue accounted for $1.2 billion at TNT in 2013 and is expected to continue to grow after several years of recession-related dips. TNT’s advertising share has also grown, and may benefit from advertising’s investment shift away from broadcast toward cable networks’ well-defined, niche audiences. Turner also offers TNT to existing TNT cable customers via user-authenticated apps on tablets and smartphones, and computer web browsers; starting in 2015, TNT will be one of the first old-media networks offered in an over-the-top (OTT) service over the Internet. Originally a haven for syndicated reruns and movie replays, in recent years TNT has tilted the balance in favor of original programming as re-run demand on the network has faltered. 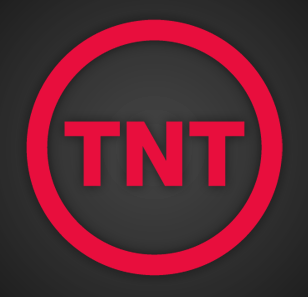 TNT programming’s tone closely mirrors the network’s slogans, “TNT is drama,” and the recent slogan tweak, “Boom.” The network now carries original and acquired scripted programming, original unscripted programming, acquired movies, and sports programming, headlined by investments in NBA and NCAA college basketball programming. Turner has pursued and leveraged internal organizational partnership opportunities in order to make their networks more attractive to sports partners. Turner purchased website The Bleacher Report in 2010 to strengthen its multi-platform negotiating position against ESPN and FOX in NBA negotiations. Turner Sports, which manages sports programming on TNT and other Turner networks, also directly co-manages NBA digital properties. Competitors to TNT include broadcast networks, cable networks, and Subscription Video on Demand (SVOD) services like Netflix. Turner also offers TNT internationally in countries such as Spain and India; however TNT’s various international iterations feature different programming that is tailored to the individual country’s market. Those TNT iterations are operated under a different division at Turner. Turner’s international presence is becoming increasingly important as Time Warner’s dependence on North American revenue is considered a threat and constraint to their business growth. TNT and Turner Broadcasting are headquartered in Atlanta, GA, where Turner is actively involved in promoting the Midtown neighborhood which houses many TNT offices. Turner itself also has offices located across the country and around the world in support of the international business, production, and news reporting. Turner’s parent company, Time Warner, is a publicly traded, international media and entertainment company based in New York City. Across all its businesses, Time Warner employed 34,000 individuals at the end of 2013. The company creates, packages, and distributes media and entertainment content in television, film, and publishing. Its businesses include Warner Bros. Entertainment, Home Box Office (HBO), Turner Broadcasting, and Time Inc. The cable businesses of Time Warner – Turner and HBO – are the stable, cash cows of Time Warner’s portfolio; within Turner, leadership considers TNT and TBS the reliable “oil tankers” of the business. Though Turner has largely operated independently from Time Warner since the two companies merged in 1996, at the start of 2014 CEO Jeff Bewkes installed Time Warner CFO John Martin as CEO of Turner, which Martin will lead not from Atlanta but from New York City. TNT’s role and position within Turner and within the Time Warner media conglomerate is critical to understanding TNT as business and creative entity. TNT is one of Turner Broadcasting’s and even Time Warner’s strongest, most stable businesses because of its operational flexibility and access to larger investments from Turner. The network’s dual-source revenue strategy has allowed it to weather sustained droughts in advertising revenue by aggressively negotiating increased subscriber fees. And programming changes, driven largely by changes in revenue strategy, have kept the network relevant and popular in an increasingly crowded and competitive cable and SVOD market. TNT’s partnerships and packaging with other Turner networks like TBS, TCM, and TruTV and other Turner properties like The Bleacher Report keep the network competitive in contract negotiations with sports leagues and cable distributors – which have become increasingly important for advertisers. Being a part of Turner also affords TNT access to larger company-wide investments in multi-platform distribution and coordinated consumer engagement opportunities, like social media. While TNT has felt critical pressure to improve the perceived quality of its original programming in light of competition from the AMC network, the network has only dabbled in that work with shows like Mob City. Instead, TNT’s programming shift has focused on attracting live viewers both for advertisers and to drive viewer attachment. The network has addressed this goal by acquiring event programming and creating more original content. TNT relationship with Atlanta may also be significantly diminishing. Layoffs, leadership in other media centers, and new corporate synergies all signal a new TNT with less Atlanta influence. TNT’s revenue strategy directly affects its programming philosophy. And no recent decision has had greater impact on TNT than Time Warner’s strategy to raise subscriber fees at its cable networks. In 2013, Turner earned $4.3 billion just through subscriber fees; TNT’s subscriber fees went from an average of $0.91 to $1.24 from 2007 to 2013, a 36.3% increase in just 6 years. TNT is now one of the most expensive ad-supported cable networks on television. And Time Warner CEO Jeff Bewkes has assured investors that the company will continue to pursue higher subscriber fees, even as provider consolidation has ramped up in recent years. The strategy successfully countered weakness in advertising revenue during the recent economic recession. In order to justify higher fees, TNT and Turner have made significant programming investment, content, and philosophy changes. That strategy has attached viewers to TNT, driving up Turner’s asking price in negotiations with cable distributors. In one recent notable case, Turner’s contract with Cable One expired just before the beginning of the 2013 Major League Baseball playoffs, which air on TBS and overflow onto TNT under TBS’ branding. Turner pulled all its channels from Cable One, including TNT and TBS, while Cable One claimed Turner sought a 45% rate hike. Though the details of the contract were not disclosed, Cable One came to an agreement with Turner after nearly a month. Turner has strategically acquired sports programming like this for TNT both for the advertising revenue and to drive up subscriber fees through enhanced consumer attachment – but those investments come with great costs. Turner split a 14-year $10.8 billion deal with CBS to host the NCAA Tournament on TNT, TBS, and TruTV. More recently, Turner split a $24 billion contract with ESPN for 9 years of NBA rights. This contract is especially important for the city of Atlanta as TNT’s sports programming is one of the only remaining pieces of the network’s Atlanta operations. Part of that contract will retain Turner Sports’ control over all NBA digital properties, a related area of significant sports programming investment. The company has also bought The Bleacher Report website for $200 million in 2010 in order to improve its negotiating position relative to ESPN and Fox Sports. Those are all huge costs reflective of the rising costs of sports programming, which eat into TNT’s ability to invest in other programming. At the same time, TNT’s bread and butter business of acquired syndicated programs and acquired movies began to falter. As viewers began to find re-runs on SVOD and more quality drama on other cable networks like AMC, ratings declined and advertisers began to leave. TNT has reacted with a large investment in new original programming. If successful, this original content that can only be viewed through TNT will help drive up subscriber fees even higher. However, with the major investments already locked up in sports programming, TNT forcefully turned to less costly unscripted original programming for the first time (after briefly entering and exiting in 2009), ordering six unscripted shows to fill programming holes for 2013. The network continues to air six unscripted shows in 2015, with three of the original six surviving the subsequent two years. TNT’s ability to sustain subscriber fee growth may shrink as the cable distribution industry consolidates and earns negotiation power through scale. If the FCC and Justice Department approve Comcast’s $45.2 billion acquisition of Time Warner Cable (a separate entity from Time Warner), Comcast will command 30 percent of cable and satellite market. AT&T and DirecTV’s pending merger would result in one company overseeing another 26 million customers. These mergers will give providers greater purchasing power in negotiations with cable networks over subscriber fees. Part of TNT’s success on non-television platforms will be learning how to (or if it can) monetize the platforms with ads. Turner and TNT’s approach is continuing to evolve. For years, Turner declined to participate in online ad exchanges. But under new management, Turner Digital Ad Sales has changed course, launching Turner Premium Xchange. The new service will allow advertisers to buy digital ad spots on all Turner networks (except Cartoon Network, which can’t legally target ads for children) that are targeted based on their own data. Turner also just began to deliver commercials to live NBA games onto TNT’s various non-television platforms at the beginning of the 2013-2014 NBA season. TNT will also be one of the first major networks offered in an Over-The-Top (OTT) service. Launching in the first quarter of 2015, Sling TV will offer 10 channels from Turner, Disney, and Scripps. The package of channels is being offered by Dish Network, a satellite television provider. Dish is positioning the service as a market entry tactic for the 20 million American households without pay-television service, not as a replacement for existing cable or satellite subscribers. The economics of the deal are still hazy, as terms of Turner’s agreement with Dish have not been made publicly available. When Time Warner CEO Jeff Bewkes installed his corporate CFO John Martin as the new CEO of Turner Broadcasting in January 2014, he set in motion a series of events that have significantly diminished TNT’s relationship with the Atlanta region. Martin, who runs Turner from Time Warner’s corporate offices in New York City, has continued Turner’s recent trend of leadership operating from other major media centers: Turner President David Levy and CNN CEO Jeff Zucker in New York; and Kevin Reilly in Los Angeles. Martin also led major restructuring at Turner in his first year at the helm, laying off more than 900 employees in the Atlanta region. TNT’s sports programming lingers in Atlanta as one of the network’s only remaining Atlanta-based pieces. Time Warner CEO Jeff Bewkes has also signaled that each of Time Warner’s companies would also try working together more often, taking away some of the autonomy TNT and Turner had operated under over the years. Historically Time Warner has operated as a collection of geographically and operationally distinct businesses. But leadership has now been re-centralized in New York and Los Angeles. And with Jeff Martin’s installation as Turner CEO, for the first time Bewkes has had his own lieutenants running each Time Warner subsidiary. Warner Bros. has already produced two HBO series for the first time ever, and more productions for HBO and Turner are in the works. Steinberg, Brian. “Inside Turner’s quest to take on broadcast.” Advertising Age 83, no. 16 (April 16, 2012): 8-10. Business Source Complete, EBSCOhost (accessed March 6, 2014). “Come for a Movie, Stay for ‘Great Escape’.” Multichannel News 33, no. 27 (July 9, 2012): 16. Business Source Complete, EBSCOhost (accessed March 6, 2014). O’Connell, Michael. “Can TNT Become the New AMC?.” Hollywood Reporter 419, no. 43 (December 6, 2013): 36. Business Source Complete, EBSCOhost (accessed March 7, 2014). Marketline: Time Warner Inc., Time Warner Inc. SWOT Analysis, (2013). Retrieved from Business Source Complete. Time Warner Inc. Form 10-K. 2012, p.5. Retrieved from Mergent Online database. IBISWorld Total Advertising Expenditure, 2014. Jannarone, John. “As Turner Beefs Up Original Shows, TNT Will Trot Out ‘Dallas’ Remake.” Wall Street Journal – Eastern Edition, May 17, 2012, B7, Business Source Complete, EBSCOhost (accessed March 6, 2014). Company Profile Contributor: Alec Latimer, Georgia State University, 2015.